Selfie Vista creates a composite of front- and rear camera images. There are plenty of sharing options but images cannot be saved. 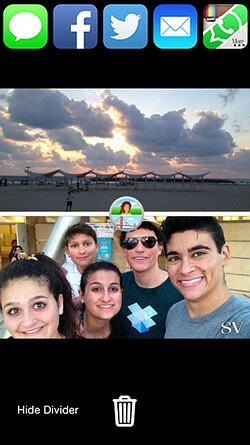 Selfie Vista is a brand new app for Apple devices that captures images with the front- and rear camera of your device simultaneously, putting them together as a composite image for sharing, all at the tap of one button. The aim is to capture the photographer's surroundings and a self-portrait all in one go. The user interface of the app is super simple and all the controls at your disposal are flash settings for the rear camera and the shutter button. After capture both images are displayed in a collage format with a divider in between. Depending on the camera orientation during capture the latter is aligned horizontally or vertically but can also be hidden. Inside its frame each image can be magnified and moved, allowing for some creativity in terms of composition. Once you are happy with your collage the final result can be shared. 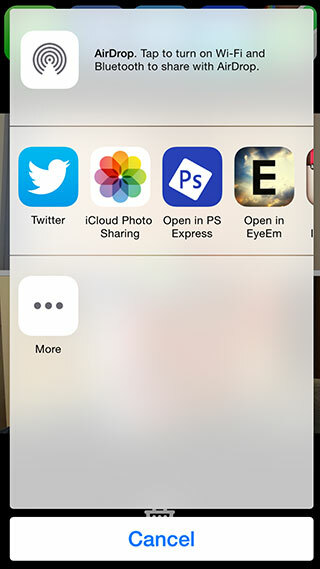 The square format is ideal for posting on Instagram but you can also share to a number of other apps and via email. Unfortunately there is no option to directly save the image on the device though. Selfie Vista works on all iPhones, iPads and iPods running iOS 6 or newer. If you want to try the app you can download it now for free from the Apple App Store.